Today, the Taiwan based tech titan has announced the release of the HTC One E8 that was initially released in China couple of months back. The device is priced at Rs 34,900 and it will debut on sale within the end of this month. Being a variant of company’s flagship model, the HTC One E8 features high-end specifications with a not too high price tag making it a good competitor in the market. Let us take a look at the quick review of the device below. The camera unit at the back of the HTC One E8 is a 13 MP sensor that is coupled with LED flash for better low light photography f2.2 aperture and FHD video recording capability. Also on board is a 5 MP front-facer that assists in video calling and in clicking stunning self portrait shots. Interestingly the front facer can also make video calls at FHD 1080p resolution thereby ensuring that none of the details are missed. The native storage capacity of the handset is pretty impressive at 16 GB and this can be expanded further by up to 128 GB with the help of the expansion memory card slot in the device. While there is 128 GB expansion support, the 16 GB of storage itself should suffice for most common purposes. The device is based on a 2.5 GHz quad-core Qualcomm Snapdragon 801 processor that is employed by the Android biggies these days. This processor is paired with Adreno 330 graphics unit for handling intense graphic rich games and other content. Also, there is 2 GB of RAM that can take charge of the multi-tasking department efficiently. The battery unit inside the One E8 is a 2,600 mAh one that is acceptable and it is rated to pump in an amazing backup of 26.5 hours of talk time and 504 hours of standby time to the device. 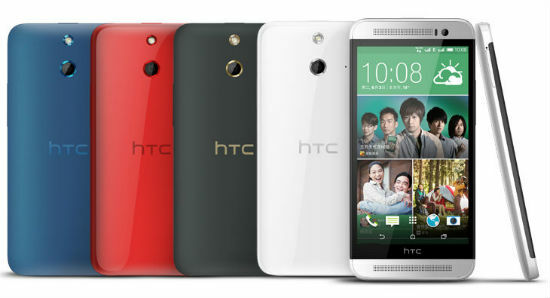 HTC has given the One E8 a 5 inch display that carries a FHD resolution of 1920×1080 pixels. This screen resolution translates to a pixel density of 441 ppi. Further, this screen is layered with the Corning Gorilla Glass 3 coating that makes it resistant to scratches. Running on Android 4.4 KitKat topped with Sense 6.0 UI, this handset features common HTC features such as BoomSound technology and dual frontal speakers that have in-built amplifiers. However, unlike the HTC devices this one features a polycarbonate build instead of brushed aluminum. The handset packs 3G, Wi-Fi, Bluetooth, NFC and GPS for connectivity on the go. Additionally, there is also a power saving mode that closes down all the unnecessary apps and services thereby helping to stretch the battery life. From the specifications and pricing, the HTC One E8 will be a stiff competitor to OnePlus One, Samsung Galaxy S5, Oppo Find 7, Oppo Find 7a and other Android biggies. The HTC One E8 is a pretty good device priced at Rs 34,900 similar to the other main Android offerings. There is a good camera set, an impressive display and other hardware aspects along with superior battery backup making the handset competent enough. The only downside is the polycarbonate build that HTC usually does not incorporate for its high-end offerings.